I’ve been reading Exodus in the mornings and keep coming back to what I don’t know how to refer to other than as the aliveness of God. He is the I AM, the living God, the God who acts, the God who really is there, the God who makes the difference, the God who can be counted on, the God who cannot be denied. The God of the Bible is so different from the other main conceptions of divinity in the history of religion. Most pagan and Eastern religions tended to see the divine as either personal but not transcendent, or transcendent but not personal. But the God of the Bible is both personal and transcendent. He is neither a tribal deity nor an impersonal cosmic force. He both made man’s mouth (4:11) and gets angry when Moses whines and makes excuses (4:14). 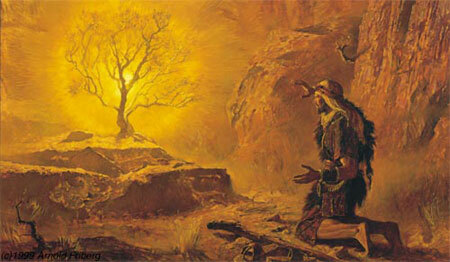 The entire first section is about God thwarting and outplaying Pharaoh with his divine power and miracles – hence the constant refrain, “then they will know that I am the Lord.” And yet God does all of this because He hears his peoples’ groaning and remembers his covenant with the patriarchs and knows his people (2:23-25). He is both transcendent and personal. It is always shocking to meet life where we thought we were alone. “Look out!” we cry, “it’s alive.” And therefore this is the very point at which so many draw back – I would have done so myself if I could – and proceed no further with Christianity. An “impersonal God” – well and good. A subjective God of beauty, truth and goodness, inside our own heads – better still. A formless life-force surging through us, a vast power which we can tap – best of all. But God Himself, alive, pulling at the other end of the cord, perhaps approaching at an infinite speed, the hunter, king, husband – that is quite another matter.